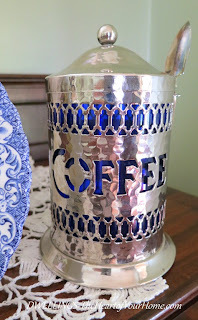 You may remember me recently sharing this English 1950's cobalt blue and silver coffee canister with you. It was one of the VINTAGE FINDS that I was taking to my shop to sell. Mr. Heart and I did a little antiquing while in South Carolina this weekend and we found these salt and pepper shakers. Makes for a nice set don’t you think? I do believe the set will be staying with me. Now I’m on the hunt to find the sugar and tea canister. I love hunting for treasures, this should be fun! They look wonderful together...what great finds! Those are lovely! I don't dare look for treasures, I don't have an inch of room for anything else. On, Cindy - how lovely! That would be my problem with owning a shop - nothing would ever make it there. I have been buying tableware, but I have not been hunting for treasures recently! There is a difference!! Those are gorgeous pieces, Cindy -- I've never seen anything like them!! 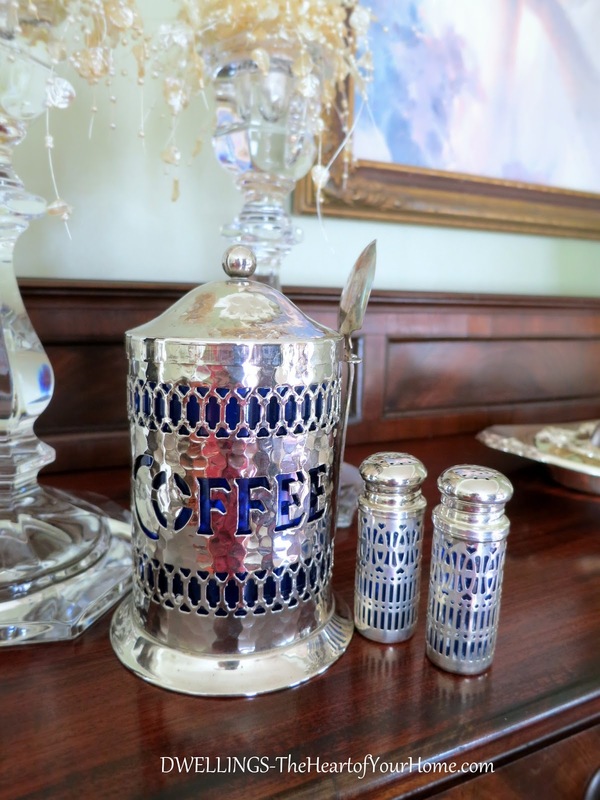 I haven't been doing any treasure hunting lately, but when we were in Georgetown, SC, a few years ago, I found a small piece of vintage Beleek for my little collection. They have some great (but pricey) antique stores. I bet you really had fun touring the plantations and gardens. 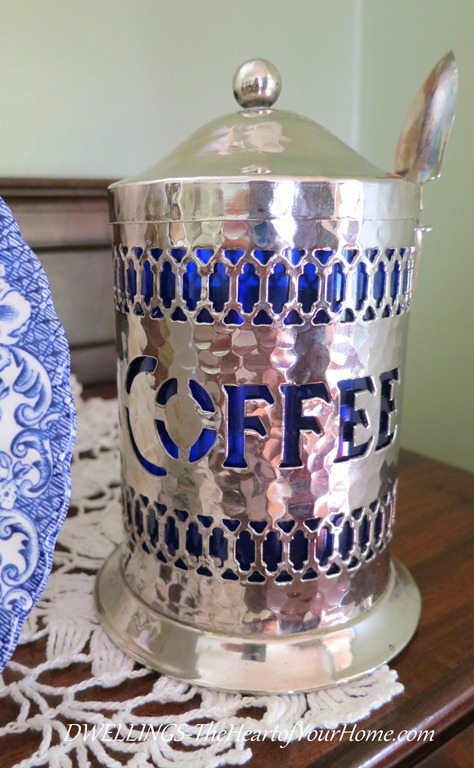 I own the exact same coffee canister and I love, love, love it...I didn't know there were other matching pieces though. Guess what I'll be in the hunt for next :-) wishing you a wonderful day. What beautiful and unusual pieces! Yes, I think those would fall into the "keeper" category. How fun to find stuff you like for yourself! Hope you soon find the other pieces too! Your salt and pepper containers are so pretty. Great find! The blue looks gorgeous with the silver. Just gorgeous Cindy! So unique looking too. Hi Cindy, The last comment just disappeared, I hope I'm not double posting this. Anyways, those are beautiful and I know you will enjoy hunting for more of that gorgeous set. Thank you for the birthday greetings it was a wonderful day! Yes, your cobalt blues do make a beautiful set! Very very one-of-a-kind look! That coffee piece is just so fabulous! The hunt is almost as good as finding a treasure, isn't it? So pretty! It makes for a "gorgeous" set, Cindy! They are all beautiful ... love the cobalt blue peeking through. So glad you're keeping them! I love this set it is beautiful! And would you believe I do have the tea canister. Very funny as I just picked it up today in my dining room and moved it to another corner. Mine is not as shinny as yours. (over from the bloghop too).